OFK Beograd and FK Zemun fans clashed at the Omladinski Stadium on Saturday during their Serbian First League match. IFK Göteborg and AIK hooligans clashed near a pub in Gothenburg city centre on Sunday afternoon. Corinthians fans fought with police in the stands before kick-off. Legia fans clashed with Spanish riot police ahead of their Champions League meeting with Real Madrid on Tuesday. Torpedo Vladimir and Tekstilshchik Ivanovo fans clashed on the pitch during the half-time break of their Russian Second Division match on Monday. Hradec Králové fans were attacked by Slavia Prague hooligans in the stands during their Czech league match on Saturday. 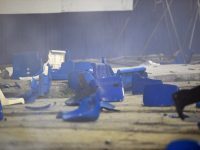 Saturday's Russian first division match between Fakel Voronezh and Dynamo Moscow was halted due to a riot. Two Feyenoord fans were being attacked by Willem II fans during the match.